Greetings again from the darkness. QWERTY. Chances are you recognize that from your laptop keyboard, and have never thought about the origin or design reason. This is just one of the fascinating topics in the surprisingly interesting and entertaining documentary from Doug Nichol (former music video guru for Aerosmith, Lenny Kravitz, Sting, and The New Kids on the Block). Did you know there are folks who collect and still use typewriters? Well there are, and you’ve even heard of some of them: Tom Hanks, Sam Shepard, David McCullough and John Mayer. We hear from each of these as they describe their connection to the “old school” way of producing text on a page. Mr. Nichol began with the idea of making a short film focusing on a small typewriter repair shop in Berkeley. As the story evolved, he learned of the many facets associated with the community of typewriter enthusiasts … those who refuse to give up the old way simply because a new way exists. There is history. There is nostalgia. There is a link to creativity. The film explores all of this and more. Christopher Latham Sholes was a believer in Women’s Rights in the 1800’s, and his invention of the typewriter was to create more job opportunities for women. His prototype looked more like a piano, and due to a lack of investor interest, he finally had to sell to Remington in order to get production and marketing. By 1890, there were 60 manufacturers of typewriters, and the Sholes and Glidden model remains a gem of any collection even today. It’s bittersweet to see the recently deceased Sam Shepard and hear him explain how he never got along with a computer screen, but loves the feel and sound of his typewriter. He created some of the most marvelous plays ever written, and compares loading the paper to ‘saddling a horse’, and notes the sound of typing has a “percussion about it”. John Mayer recalls seeing Bob Dylan “playing” a typewriter as he wrote his songs, and has since made it apart of his own songwriting process. An inordinate amount of time is spent with Mayer onscreen, but it does make the point that even the generation raised on technology can find value in an object that was once an office staple, and is now a mere relic to most. Writer David McCullough claims the typewriter is the only way he can write, and Tom Hanks seems to truly enjoy talking about his typewriter obsession, and how he spends time each day typing out thank you notes and correspondence. The repair shop is the heart of the story, and we continually come back to Ken Alexander as he lovingly restores each machine that comes in. It’s with a bit of irony that we watch Ken and the store owner Herb come to realize that they must rely on today’s technology of websites and social media as a last hope for survival. In stark contrast to Ken bringing typewriters back to life, we see modern sculptor Jeremy Mayes as he scavenges for typewriter parts for his latest piece. And in an odd twist, we meet a group who makes music with typewriters and actually perform classic songs with their own vibe. Nostalgia has brought back vinyl records, and there is a community of folks who believe the typewriter revolution is underway. The rationale is that technology is now ruling our lives and we need to step back and get in touch with what is real and produce tangible results – not just use up storage on a hard drive. 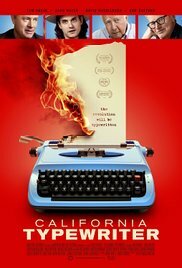 While we may not be convinced that “the revolution is typewritten” (from The Typewriter Insurgency Manifesto), the film is actually thought-provoking as it tracks and connects humans-machines-technology. This entry was posted on Thursday, August 17th, 2017 at 10:00 pm and is filed under Documentary. You can follow any responses to this entry through the RSS 2.0 feed. You can leave a response, or trackback from your own site.